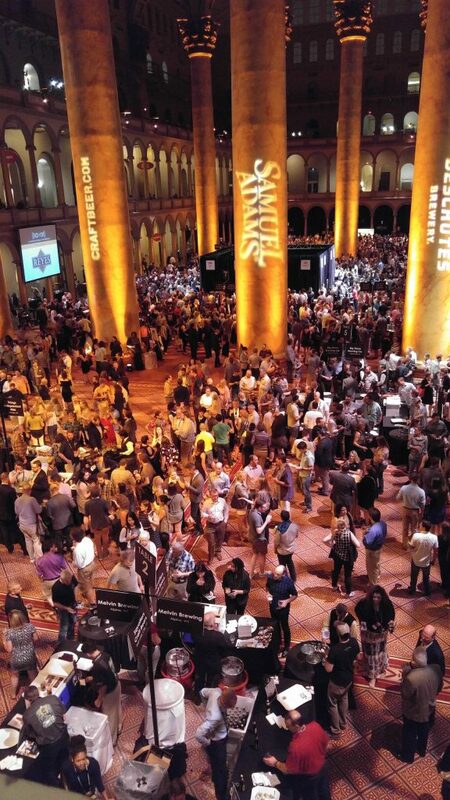 Walking through the Great Hall of the National Building Museum in Washington D.C. June 3, tasting suds from the 76 breweries, it was easy to see the hottest trends in the craft beer industry. The Brewers Association’s ninth annual SAVOR- An American Craft Beer & Food Experience, showcased the best of industry and offered a window into latest trends from breweries small and large, new and old. Julia Herz, craft beer program director of Brewers Association, said the brewers at Savor showed innovation from the beer making to packaging to food pairing. Samuel Adams offered pours of its new Nitro White (gold medal winner in the 2016 NY International Beer Competition), a smooth tasting wheat style beer with hints of orange. Sam Adams had recently become one of first big brewers to offer nitro-style beers in cans. Unlike most beers that are infused with carbon dioxide to give it some bubbles, nitrogenated beer infuses nitrogen gas into beer and is largely insoluble This gas gives beer a creamy and smooth mouth feel. Nitro beers also tend to have less perceived bitterness because CO2 is acidic which adds to bitterness perception. Although Nitro beers like Guinness have been around for decades, other breweries are getting into the game with more than just stouts. At Savor, the Nitro White was paired with a cherry linzer torte. The Boston brewery also offered its new sour-beer, Kosmic Mother Funk, which is paired with rabbit sausage. As with past Savor events, the two-evening event proved to all 4,000 attendees how beer goes with much more than just pizza. Among one of my favorites from the event was Hardywood Park Craft Brewery’s Bourbon Barrel Raspberry Stout paired with a lamb tartare and orange cocoa cracker. I’ve had the stout from the Richmond, Va. brewery before but the bourbon aging added just the right amount of subtle flavor to make it even tastier and a bit complex. The raspberry flavor was one of many fruits on display in beers at the event. Strange Craft Beer Co. of Denver had its Cherry Kriek, a Belgian fruit beer paired with duck breast. New Belgium Brewing Co. of Fort Collins, Colo. had its new Citradellic, an IPA made with tangerine infused orange peel. “Beer amped up with fruit are a new twist,” Herz said. Just don’t call them fruity beers. One beer I had to try more than once was Atwater Brewery’s Decadent Dark Chocolate Ale which was paired with crème brulée. Dessert in a glass. The taste was smooth and velvety event though the ABV was just 4.5%, low by chocolate style beer standards. Atwater’s top selling beer is its Vanilla Java Porter so the Decadent next step as an English-style porter with three types of chocolate blended together to make it rich but not too sweet. It was a pleasant surprise to find several breweries offering pilsner style beers, including DC Brau of Washington D.C. It used to be that craft brewers stayed away from pilsners because that was the only style generally offered in the 1970s and 1980s when few breweries remained in America and most beers tasted alike (New Yorkers would recall Schaefer or Rheingold beer). Newer craft brewers often avoided pilsners because they typically take two more weeks in fermentation than other styles but now with craft beer growing up, brewers are willing to take the extra time. The Brau Pils from DC Brau was made with traditional noble hops and was paired nicely with a grilled peach and smoked faro. Port City Brewing Co. from Alexandria, Va. also brought its Downright Pilsner to Savor. The clear, crisp taste of the beer was enhanced by a pairing with pork schnitzel, lingonberry and red cabbage. A few breweries also showed at Savor they were not afraid to turn up the heat in their beers including Burnside Brewing which had its Sweet Heat Ale. The beer made with apricots and Jamaican scotch Bonnet peppers didn’t set your mouth on fire but did leave a full spice feel on back of your throat. Hence, it was paired with a creamy chickpea panisse. Marker 48, a new brewer in Weeki Wachee, Fla. had its Meet the Heat Saison and Saugatuck Brewing of Douglas, Mich. offered its Serrano Pepper Ale. One of the oddest beers I had was Barrel of Monkeys, a barleywine made by Devil’s Canyon Brewing of San Carlos, Calif. The beer has been made just three times since 2003 and was the first barrel aged beer by the brewery. The beer, which comes in amazingly designed bottles, is aged for 6 months in bourbon barrels and leaves a smooth bourbon burn, with hints of Madagascar vanilla, brown sugar, cinnamon and toffee flavors. “Our barrel aged and sour beers are not huge in volume but we have seen the market increase for these as people‘s tastes develop,” said Chris Garrett, head of brewing operations at Devil’s Canyon. The true highlight of Savor was not just the beers—which were diverse and tasty—and the food which was delicious—but the chance to talk to so many brewers and brewery owners who each had a story to tell about their beers and their companies. Brewers were chosen on a lottery system for Savor and half had never participated before. That meant attendees at Savor got to drink many beers they’d never heard of before. While craft beer’s stalwarts including Sierra Nevada, Dogfish Head and Sam Adams have become national names, more than 96 percent of today’s 4,400 plus breweries make less than 15,000 barrels of beer a year. SAVOR provided a national platform for regional and smaller local breweries to broaden their exposure to an audience they may not otherwise reach. What is clear is the brewery owners don’t feel constrained by old rules about beer and feel free to push the boundaries of craft beers—and with it beer drinker’s taste buds to places they haven’t gone before.